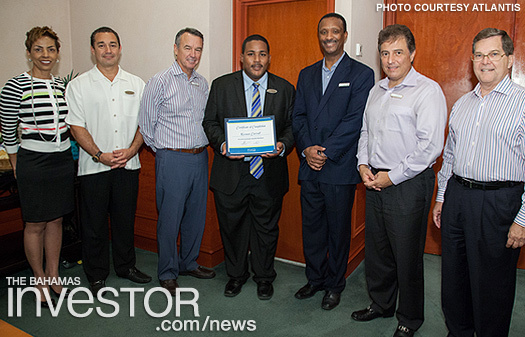 Another five employees of Atlantis Paradise Island recently completed the resort’s Manager Trainee Programme. Another five employees of Atlantis Paradise Island recently completed the resort’s Manager Trainee Programme, which takes participants through a series of rotations throughout the various departments and challenges of hotel operations to ready them for advancement opportunities. 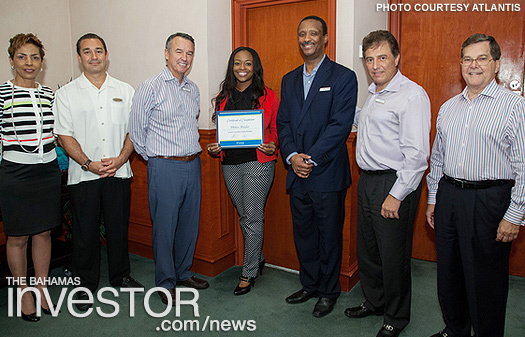 In recognition of their accomplishment, senior executives at the resort hosted the group to a certificate ceremony. “This is a very special programme for us and we feel it is the right kind of investment to make in our people to not only help keep this amazing resort successful for generations to come, but to help further develop and advance some of the youngest and brightest talent in the hospitality industry,” said senior vice president of human resources Karen Carey at the ceremony. Keenan Carroll, Philece Huyler, Krystal Morley, Jeffrey Rodgers and Renbert Mortimer have now completed some 15 months of training, working with various general managers, division and department heads, as well as other leaders throughout the Atlantis resort. They have since been placed in their respective management roles. Speaking on behalf of the new group of Atlantis managers, Carroll said that the journey was well worth the effort. Also in attendance was Atlantis president and managing director George Markantonis. In congratulating the group, he noted the importance attached to their roles in the resort’s future. Carroll, Huyler, Morley, Rodgers and Mortimer were selected from an estimated 190 persons who applied for the programme. Pictured: (from left) Karen Carey; Cristian Sariego, senior vice president and general manager of Reef/Cove; Paul Burke, chief operating officer; Keenen Caroll; Stuart Bowe, senior vice president and general manager of Coral/Beach Towers; George Markantonis; and Stephen Sawyer, senior vice president and general manager of Royal Towers. Pictured: (from left) Karen Carey; Cristian Sariego, senior vice president and general manager of Reef/Cove; Paul Burke, chief operating officer; Philece Huyler; Stuart Bowe, senior vice president and general manager of Coral/Beach Towers; George Markantonis; and Stephen Sawyer, senior vice president and general manager of Royal Towers. Paradise Island Harbour Resort closed last week as the hotel undergoes extensive refurbishment. The resort will reopen in February 2015. Watch a ZNS Network news report here. Prime Minister Perry Christie gave the keynote address at a ceremony held last week in Nassau to honor 41 Bahamians that have made significant contributions to culture and the arts. Watch a ZNS Network news report here.